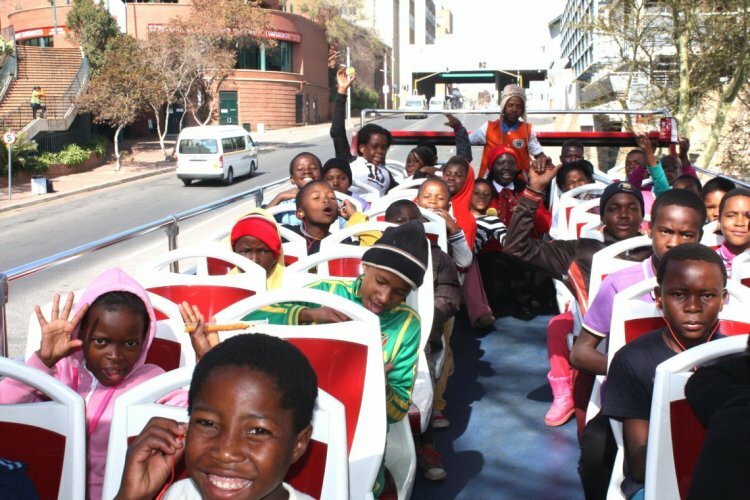 City Sightseeing South Africa acknowledges that our business depends on people. We therefore aim to make a positive contribution to our community partners in Cape Town and Johannesburg through donations and enterprise development within the tourism industry. To this end we support iKhaya le Themba in Hout Bay, Cape Town, by contributing a percentage of your bus ticket costs to this admirable cause. iKhaya le Themba, or “Home of Hope”, is a community-driven initiative that offers after-school care with structured programmes to orphaned and vulnerable children. We encourage our passengers to visit this initiative during the Imizamo Yethu guided Township walking tour. We coached the guides to establish their own unique walking tour, thus stimulating economic growth and bringing empowerment to the community. Visitors can enjoy a cup of coffee and marvel at the artworks on display whilst chatting with the children. There are many ways in which one can get involved and the staff on hand are more than happy to inform interested parties. In Johannesburg, through our partnership with local entrepreneur Kgomotso Pooe, who started SoWeToo, and the establishment of the City Tour and Soweto Combo, we've helped create jobs. SoWeToo is now an example of a thriving South African business that also offers walking and bicycle tours in Soweto, and works hand in hand with various restaurants in the township. A wonderful offshoot from the success of our Soweto add-on tour was the launch of a Cape Town-based township tour called LaGuGu, which visits the townships of Langa and Gugulethu. The LaGuGu tour is another partnership initiative with the same entrepreneurial organisation that runs the Soweto tours.